2015 March Madness Odds: Can Anyone Beat Kentucky? 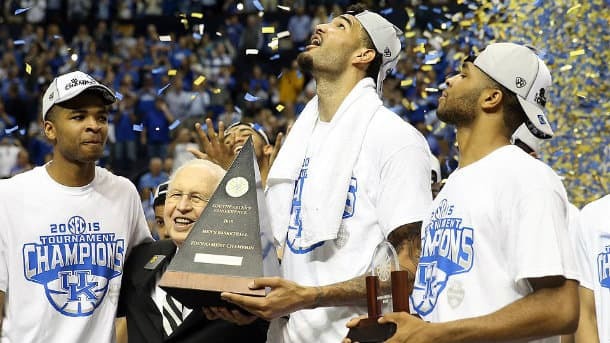 You are here: Sports Betting Online > March Madness Betting and Brackets >	2015 March Madness Odds: Can Anyone Beat Kentucky? I’m sure most of you have been scrambling to fill-in your March Madness brackets. The four play-in games will be played today and tomorrow, so we still have a couple days to get our brackets submitted. The biggest question on everyone’s mind is whether or not Kentucky will lose? Think you know college hoops? Head over to the TopBet Sportsbook to play in the March Madness parlay challenge. Bet $10, correctly pick 16 round two games and you’ll win $100,000 cold hard cash. You can view the complete 2015 March Madness bracket at ESPN. #1 Kentucky, #1 Villanova, #1 Wisconsin and #1 Duke have all earned a top seed in the tourney. How many will make it to the Final Four? Looking back – exactly one #1 seed has made the Final Four every year except for one since 2010. In 2011, no #1 seeds made it into the Final Four. I don’t see as much depth this year in the bracket as in year’s past, so I expect at least two #1 seeds to advance. I personally have the Kentucky Wildcats and Wisconsin Badgers making it to the F4. Kentucky is in the Midwest, which appears really tough, but I feel much worse for the other teams in the region than I do the Wildcats. Kentucky 34-0 (18-0 SEC) looks to be unstoppable. They just ran through the SEC tournament and won every game by double digits. Kentucky are not just a step above the competition – they’re playing like they’re from another galaxy this season. I believe the Badgers are the second best team, but Wisconsin are in the West region and therefore will have to play Kentucky in the Final Four if they make it that far – rather than the finals. So, who do I have advancing out of the East and South regions? In the East, I took #2 Virginia to beat Villanova in the Elite Eight. In the South, I took Gonzaga to beat Duke in the E8. On my main bracket, I have the Zags losing to Kentucky in the finals. Gonzaga 32-2 (17-1 WCC) only played one team in the top 20 this season – a game they against Arizona (66-63) in OT. That worries me, but this is the best shooting team in the nation. When it comes to March Madness I’m always a fan of offense over defense. The Zags rank 1st in FG% (52.4%), 4th in 3PT% (40.8%), 10th in points scored (79.1 PPG) and 30th in rebounding (37.9 RPG). This is a team I wouldn’t bet against early in the 2015 NCAA Basketball tournament. The other #2 seeds are Kansas (Midwest) and Arizona (West). #3 Baylor and #4 North Carolina are strong teams in 2015, but they’re both in the West region, which is extremely tough. Before the bracket I liked #4 Maryland a lot, but that has changed. The Terps are in the Midwest and will have to play Kentucky in the Sweet Sixteen. Last year, a #7 (UConn) and #8 (Kentucky) seed made it to the National Championship Game, but don’t expect that to happen again. This year won’t have nearly as many fireworks as 2014. Looking back, high seeds dominated the tournament in 2007, 2008, 2009 and 2012. With that being said – we can still expect some underdogs to win in the first couple rounds. I have #12 Buffalo advancing against #5 West Virginia in the Midwest. I’m also high on #10 Davidson this year, as they have proven throughout the year that they can score points with anyone. Unfortunately, Davidson have to play the Zags in round three, which is the worst possible match-up for the high-scoring Wildcats. If we’re going to see any fireworks – they’ll likely come from the East region. #12 Wyoming and #11 BYU could win a game or two potentially, but I think we should be targeting slightly higher seeds. #9 LSU and #7 Michigan State are two sleepers that have the talent to run through the East and make a surprise run to the Final Four. MSU is my best sleeper pick. The Spartans really should have held on to beat Wisconsin in the Big Ten Championship Game. Live odds from BetOnline Sportsbook.